JohnRoscigno.com: Just brilliant. Don't forget to vote tomorrow! Today was kind of miserable - My throat hurts, my nose is running, and I've got a cough - but thankfully I've got no fever or headache - that would be awful. But my French test went really well (I think) so hopefully that'll be looking up later this week. Today I just rested a lot and drank a lot of tea. I'm feeling a bit better now, at least I'm not feeling worse. Tomorrow is the election...EVERYONE VOTE! 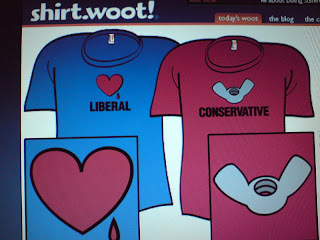 I saw these on shirt.woot.com and thought it was amazingly hilarious. I had to buy one. and one for Bunny too. Guess which one. Hint: not the red one. Second Hint: It has a heart on it.